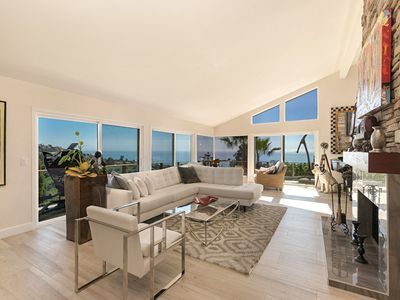 Welcome to this freshly updated two-level home in a wonderful Newport Beach neighborhood just a minute walk from the sand, and extremely close to the shops and restaurants - making it super easy to truly enjoy the experience of seaside living at its best. 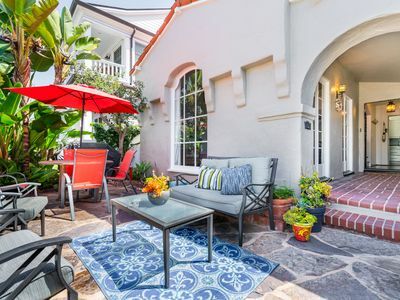 Just a one-minute walk to the sparkling Pacific Ocean in cosmopolitan Newport Beach, you are also close to shopping and restaurants, as well as an abundant choice of activities and attractions – on both land and sea in Newport Beach and the surrounding area. 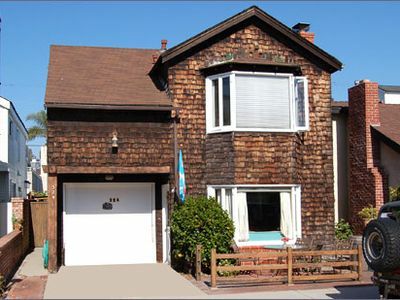 Enter this 4-bedroom 3-bath 1779 sq. 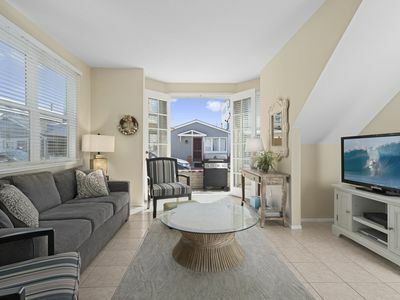 ft. 2-story home with newly refurbished floors and colorful, comfortable beach chic décor - and find yourself in a large, light spacious great room with a living room area that has comfortable cluster seating, a large flat screen TV, a fireplace, and a ceiling fan to keep you comfortable. 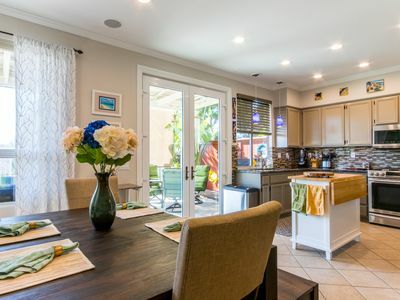 The kitchen, dining, and living room areas all take advantage of the fresh air, lots of light and a patio view. The patio has a 5-burner barbecue, and comfortable seating for 6 which make it a perfect place for an al fresco brunch or Happy Hour. 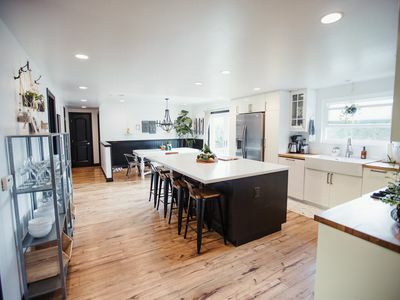 A nearby kitchen bar with 4 high-top stools makes it easy for everyone to be together even if there are more than 6 guests. A bright thoroughly modern kitchen provides all you need to meet your culinary needs. All you need do is add the food and the camaraderie and have a good time. There is also a full bath with a walk-in shower downstairs. 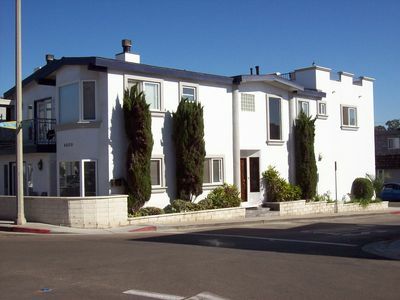 The 3 guest bedrooms upstairs share a hallway bath they with a large walk-in shower and dual vanities. And of course all bed and bathrooms are furnished with premiere linens for your every comfort. The master bedroom has 2 queen beds, a large flat screen TV and an en suite bath with a large walk-in shower and dual vanity sinks. It also has a slider closet and a ceiling fan to keep your comfortable. There are three remaining guest bedrooms on the 2nd story – each with a queen bed, a flat screen TV, a ceiling fan, and a slider door closet. 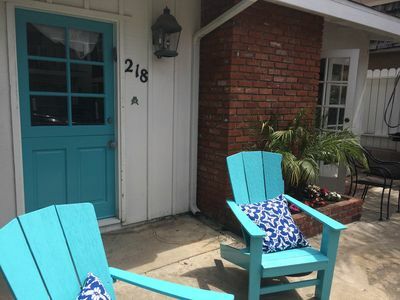 With a full sofa bed in the living room area, this home comfortably sleeps 12 in beds. Other amenities include one extra wide garage parking space (Still only for one vehicle) and street parking for all other vehicles. There is also a washer and dryer for your convenience, and WIFI and able are also provided. 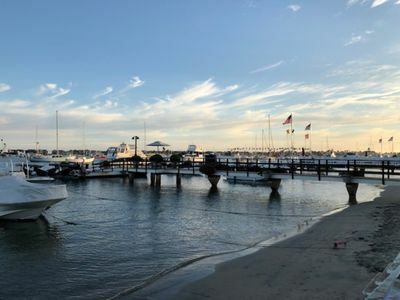 Newport Beach harbor is the largest harbor on the west coast – and Newport Beach itself is a quintessential beach community with a nice luxury vibe. Come enjoy this little slice of paradise and create beautiful memories that will last a lifetime. 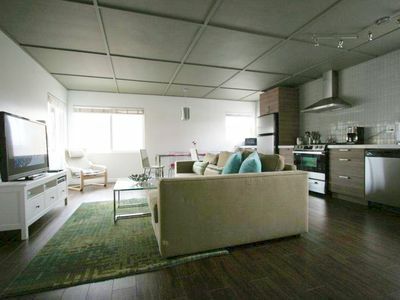 -Location – quick walk to the beach, and walking distance to shops, restaurants and attractions. 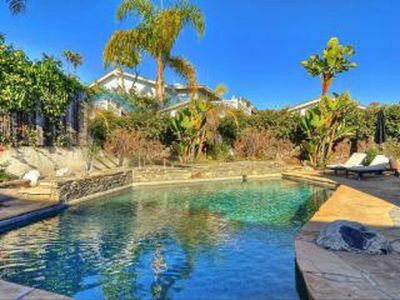 -It is perfect for a large family or families vacationing together. 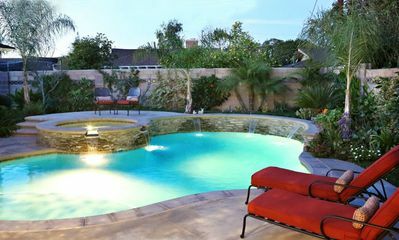 -It has a wonderful private patio from which to enjoy the beautiful Southern California climate any time day or night. -No smoking on the property - NO EXCEPTIONS (this is inside and outside the property). 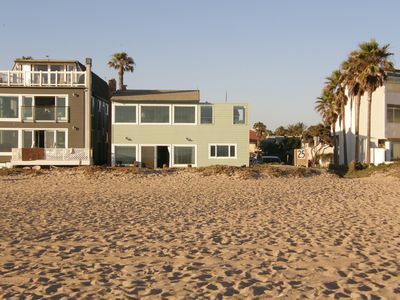 -This home does not have air conditioning (due to the moderate coastal climate in this area). -There is no outside-amplified noise (i.e. music) allowed at any time. Our rental agreement includes a no tolerance policy towards excessive noise, occupancy, and/or parties. 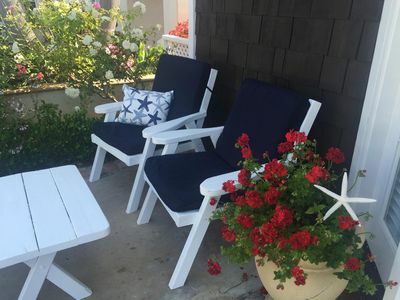 Please make sure you are comfortable with these policies before renting with SeaBreeze Vacation Rentals. 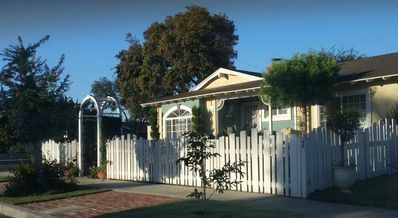 Your Balboa Island Vacation Magic! 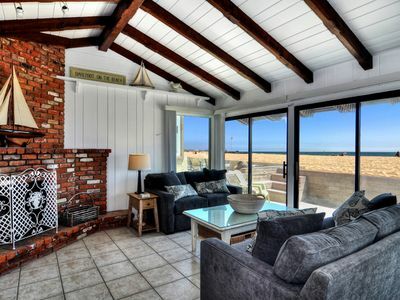 Luxury Oceanfront 3 Bed/2 Bath Home on the Sand! Newly Remodeled & Furnished! 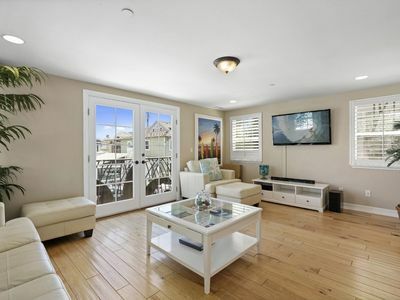 Oceanview Condo - Steps from the beach! 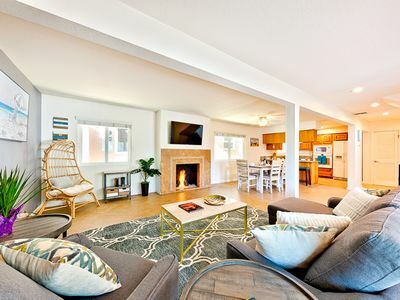 Sweet,BeachHome-Comfie,Clean,easy chk-in and just feet to the SandyBeach! 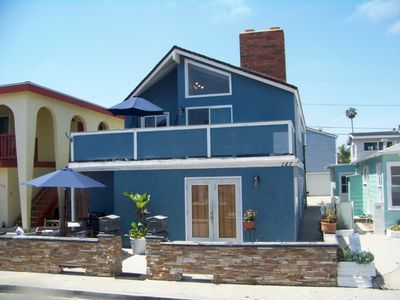 One of the best vacation rentals on Balboa Island!! 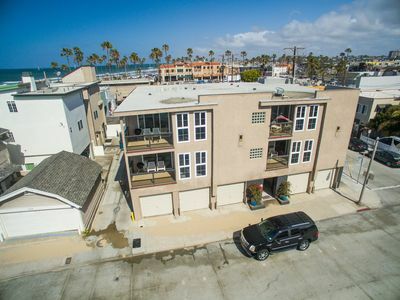 Whispering Iris - Luxury Home Blocks from the Beach!